The Skinny: The fighting in this action-comedy is sparse, but decently done. Sammo Hung fans might find this reasonably entertaining. by Kozo: Eighties ghost kung-fu comedy from the ace (?) team of Wu Ma and Sammo Hung. Hung is Fatboy, a bumbling kung-fu student who works for uncle Lam Ching-Ying. 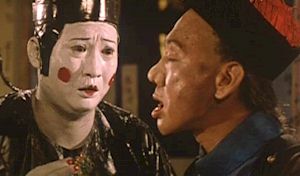 When pal Luncho (Wu Ma in a hideous prosthetic nose) dies, Hung find himself beset by his old pal's ghost. Luncho possesses him to avenge his murder, leading to lots of wackiness, a few fights, and the sight of Sammo Hung naked. Lam Ching-Ying does some of his patented Taoist shtick, and a very young Cherie Chung appears as Fatboy's long-waiting fiance.